The Call of the Wild? 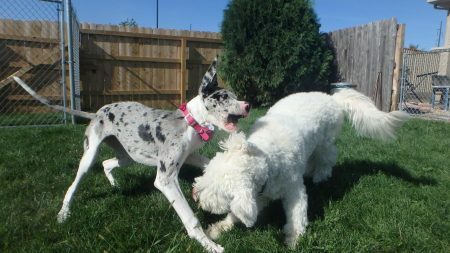 Well, her name is Moose V (Great Dane) and she looks like she is singing in the ear of Loki C (Goldendoodle). If so, I hope for Loki’s sake that Moose carries a tune as well as they play at JDPC!